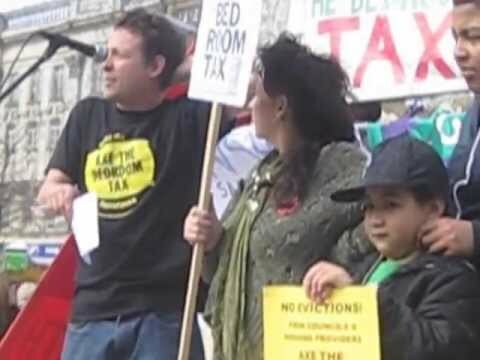 Saturday’s Bedroom Tax protests showed that the movement is growing and deepening. In Leeds 1,000 people marched. This was the result of a growing campaign on the estates most affected by the tax. Protestors called on Leeds Labour council to refuse to do the Tories’ dirty work. In Birmingham over 100 people gathered to hear speeches from those affected, trade unionists and campaigners. Josh Jones, the only Labour Councillor to abstain from voting from cuts in the recent council budget, called for Labour councils to have a policy of no evictions. On Saturday 11th May the Benefit Justice Campaign is holding its second Benefit Justice Summit in Westminster Central Hall. This is a crucial opportunity for campaigners to come together to learn from each other’s experiences and discuss priorities and actions over the coming months. Please forward details of bedroom tax protests in London for May. Thank-you!